01-15-15: Imam Elahi speaking with Carol Costello on the morning CNN Newsroom show. IHW is receiving encouraging comments from all over the country for the inspiring and energizing words of imam Elahi with CNN this morning. Imam Elahi mentioned how Islam and Muslims are a target of both physical and psychological terrorism. Also that our world is in need of leaders like Martin Luther King, that is why the interfaith of our community are coming to the Islamic House of Wisdom this Sunday to honor his non-violence movement. He added that people like Ayatollah Sistani and former Iraninan President, Khatami are the Martin Luther King examples of our time. Reminding that President Rouhani brought an anti-violence and anti-terrorism push to the UN. Imam Elahi stated that if the US and other Western governments are serious about fighting against ISIS and other terrorists, why are they so close with Saudi Arabia, the source of terrorism yet not even talking with Syria that has been fighting terrorism for 4 years and only in 2014 has lost more than 70000 of it citizens in this war. There was a lot to share but how much can u say in 4 minutes? Please send us your thoughts! DEARBORN HEIGHTS (WXYZ) - A local Islamic leader is speaking out about this week's terror attacks in Paris. Imam Mohammad Ali Elahi of the Islamic House of Wisdom in Dearborn Heights said such acts of violence hurt the image and message of Islam. "They are not jihadists, they're a bunch of jerks," the Imam said of the two brothers, Cherif and Said Kouachi, who carried out the deadly attack on the office of Charlie Hebdo, a satirical newspaper in Paris. "We feel sad because then our faith is under fire our faith is under attack," Imam Elahi said after his sermon. "These guys have nothing to do with Islam. That was a stupid act by stupid individuals who were brainwashed," he added. Unfortunately, Imam Elahi said, the misunderstanding of Islam - or "Islamaphobia" - is a reality many face even in Dearborn, home to the biggest population of Arab Muslims in North America. He said it will take informed dialogue to break the barriers of that misunderstanding and that the responsibility not only rests with Muslims but also the greater community. The Islamic House of Wisdom is located at 22575 Ann Arbor Trail in Dearborn Heights. They are also honoring the victims and showing solidarity with the people of France. The Friday sermon at the Islamic House of Wisdom in Dearborn Heights by Imam Mohammed Elahi was emotional. Leaders of the southeast Michigan Muslim community condemned the attacks in Paris this week that claimed the lives of 12 persons at the offices of a satirical magazine. After tense standoffs Friday that involved hostages in two locations, French authorities cornered and killed two brothers they believe were responsible for the slayings at the Charlie Hebdo magazine. A third person who held a hostage in a separate location also was killed. Prior to that outcome, representatives of the Imams Council of the Michigan Muslim Community Council denounced the attacks. “Neither God, nor Muhammad, whom they thought they are defending, nor the overwhelming majority of Muslims, would sanction such a heinous crime,” Imam Mohammed Elahi and Imam Mustapha Elturk said in a joint statement. The imams are the religious leaders in the Muslim community in southeast Michigan, including those who reside in Macomb and Oakland counties. Southeast Michigan is home to tens of thousands of Muslims. Charlie Hebdo magazine, its journalists and cartoonists routinely satirize politics and religion, including the Islamic faith. The magazine’s depiction, in particular, of the prophet Muhammad as a “terrorist,” angers members of the faith who find the depictions offensive, the imams acknowledged. But responding with violence is not justified nor sanctioned by Islam, they said. The religious leaders also implored non-Muslims to resist the temptation to blame all Muslims for the violent acts perpetrated in France. “We ask all people of conscience not to paint the entire Muslim people with the same brush,” the imams said. “We ask all citizens to refrain from violence and promote peace. Among its goals is to promote unity and cooperation among the diverse Muslim communities; promote the best Islamic and American values; pursue social justice, improve human relations and uphold human rights in America. Muslim imams from across metro Detroit gathered on the steps of Dearborn City Hall Aug. 25 in a united voice to speak out against ISIS, the Islamic State militant group wreaking havoc in Iraq and Syria. The Islamic House of Wisdom, a Dearborn Heights mosque, organized the unity prayer and candlelight vigil where imams from the Imams Council of the Michigan Muslim Community Council spoke. Dawud Walid, executive director of the Michigan chapter of the Council on American-Islamic Relations, said the imams have always condemned terrorists, whether they be al-Qaeda, ISIS, or Boko Haram. “We’re here primarily to defend the true message of Islam,” he said. Imam Aly Lela, of Troy, said ISIS is killing in the name of religion but they are not that religion. They are evil, he said. “This is not the Islam that we know. This is not the Islam that we practice,” he said. The imams were also supported by those in the crowd who agree with their message. “We just believe in supporting the Muslims against the terrorists,” said Judy Satterthwaite, 75, of Rochester. She heard about the rally and came out with three friends, all in their 70s and 80s, from Rochester Hills. Speakers also talked about American journalist James Foley, who was abducted by ISIS in Syria and is shown in a recently released video being beheaded by the group. All observed a moment of silence and lit candles in his memory. Imam Mustapha Elturk, of the Islamic Organization of North America in Warren, sent his condolences to Foley’s family and other victims’ families. “The barbaric behavior of ISIS is abhorred and cannot be justified,” he said. Contact Staff Writer Aysha Jamali at ajamali@digitalfirstmedia.com. Organized by imams with the Michigan Muslim Community Council, the speakers included both Shia and Sunni leaders of different ethnicities and races, all united in saying ISIS doesn’t speak for them. Monday’s event was the third anti-ISIS rally in Dearborn this summer that was organized by local Muslims. Two rallies organized by Shia leaders were held in Dearborn in June that condemned ISIS. Hundreds attended both rallies. About 50 attended Monday’s rally, which included remarks by local imams, Osama Siblani, publisher of Arab American News in Dearborn, Dawud Walid, director of the Michigan chapter of the Council on American-Islamic Relations, and Steve Spreitzer, president and CEO of the Michigan Roundtable for Diversity and Inclusion. Siblani and Elahi asked the U.S. to stop supporting Syrian opposition groups such as ISIS. The U.S. has said it supports moderates in Syria’s opposition, not extremist groups like ISIS. Elahi also criticized Israel’s actions in Gaza. One cleric in Dearborn, Ahmad Jebril, has become the most popular religious leader online for ISIS fighters from the West, according to a British think-tank. But leaders at Monday’s rally were squarely united against ISIS. Contact Niraj Warikoo: 313-223-4792 or nwarikoo@freepress.com. Follow him on Twitter www.twitter.com/nwarikoo. Imam Steve Elturk and Imam Elahi, Sunni and Shia co-Chairs of the MMCC Imams' Council appeared on Local 4’s Flashpoint on June 26 to talk about Ramadan. Eid marks the end of the fasting month of Ramadan, when Muslims believe that Islam's holy book, the Quran, was revealed by God to Mohammed, the prophet of Islam. Muslims across metro Detroit marked Eid on Monday, celebrating the holy day while also grieving for casualties in Middle East conflicts. In his sermon Monday after Eid prayers, Elahi criticized both Israel and the Islamic State, formerly ISIS, a militant group in Iraq and Syria. “They have nothing to do with Islam,” Elahi said of the group. Eid marks the end of the fasting month of Ramadan, when Muslims believe that Islam’s holy book, the Quran, was revealed by God to Mohammed, the prophet of Islam. Elahi urged the congregation to continue six lessons from Ramadan: prayer, patience, charity, humility, respect, and responsibilities. After Eid prayers, Wayne County Executive Robert Ficano spoke at Elahi’s mosque, presenting a certificate from the county recognizing Eid. DEARBORN HEIGHTS — American Muslims gathered at the Islamic House of Wisdom here Nov. 24 for a commemoration ceremony held in remembrance of those who lost their lives Nov. 19 in double suicide bombings that killed 25 people at the Iranian embassy in south Beirut. The suicide bombings were carried out by a Lebanon based Al-Qaeda linked group who threatened future attacks unless Iran withdrew its troops from Syria. During the ceremony members of the Muslim community including religious leaders condemned the attacks, and said the terrorist group that committed them in Islam’s name doesn’t reflect the faith’s peaceful teachings. Those who attended prayed for the fast recovery of people who were wounded in the attack, and others who lost their loved ones. "The actions of a few do not resemble Islam. Of course we condemn this type of terrorism. People who commit acts of terrorism in the name of Islam, may claim to be Muslim, but they’re not. In Islam even animals are protected and respected," said Iranian American Ali Sharief, a Dearborn resident. "Definitely we condemn the attacks on the Iranian Embassy…This is a crime against humanity in our eyes, and criminal activity. And we hope the government takes these criminals and puts them in the place where they belong." Younes Makki, a 14-year-old Dearborn resident who’s Lebanese recited a prayer from the Quran for the victims who lost their lives in the attacks. A lot of young Muslim Americans attended the ceremony to pay tribute to the victims and express solidarity with their families. "I feel like it is really sad. I was born here, but I still care about the violence plaguing the country I trace my roots to," Makki said. Imam Elahi of the Islamic House of Wisdom asked the crowd to also remember victims of similar attacks in countries such as Iraq, Syria, Pakistan, Afghanistan and other countries that have become vulnerable to terrorism in recent years. "We know what Islam is. It is peaceful, humble, kind and loving. The people who commit acts of terrorism against Islam add fuel to the fires of Islamophobia," Elahi said. Iranian and Arab Americans in communities across the country are expressing enthusiasm about the historic agreement between Iran and six world powers that was finalized on Sunday, Nov. 24. The deal between Iran and the six major nations, which include the U.S., Britain, France, Russia, China and Germany, places constraints on Tehran’s nuclear program in exchange for relieving some economic sanctions on the Islamic republic. The agreement also calls for more intrusive international monitoring of Iran’s much disputed nuclear program. “I think it is not an exaggeration to say this is a historic deal, and I consider it a great victory for peace, diplomacy and dialogue,” said Iranian American Imam Elahi of the Islamic House of Wisdom in Dearborn Heights. Elahi also congratulated Iranian president Dr. Hassan Rouhani, whom he met with in September along with a group of Muslim American leaders, following Rouhani’s address at the United Nations General Assembly in New York. He said much of the negative press on Iran in the Western media over the last few years has actually drawn attention away from other critical issues, such as Israel’s military occupation and illegal settlement activity, and Saudi Arabia’s support for terrorism. “What no one thinks about is that the Saudis are the biggest supporters of terrorism in the Middle East. All they want to talk about is Iran, but no one talks about the real problem in the Middle East, which is the occupation on the Israeli side and terrorism on the Saudi side,” Elahi added. For decades, the diplomatic relationship between the U.S. and Iran has been sour. “Finally, wisdom won this diplomatic war. After having no diplomatic relations for decades and to sit down and have dialogue by itself is a big development regardless of the details of the agreement,” Elhai said. Elahi says Iran didn’t lose anything in the deal. He noted that limitations on its nuclear program to prevent it from building a weapon were pointless, as the country never had any intention of doing that in the first place. Meanwhile, the recent developments with Iran seem to have thrown a wrench in U.S. relations with Israeli leaders. Hours after the historic agreement was signed, Israeli Prime Minister Benjamin Netanyahu addressed the media to voice his discontent, calling the development a "historical mistake." University of Michigan-Dearborn Political Science Professor and Author Ron Stockton tells The Arab American News that despite Netanyahu's disapproval, the agreement will not have much of an impact on the American relationship with Israel in the long run. "This is not going to make matters worse with Israel. Netanyahu has been openly hostile to Obama for a while now, campaigning against him during the last election. The relationship is tense, and not so positive, but it will not change the country's relationship with Israel in any final way," Stockton says. Meanwhile, a poll conducted by ABC this week found that the majority of Americans are backing the agreement. The poll found that 64 percent of Americans support the nuclear deal with Iran, while 30 percent oppose it. Stockton believes the divide in opinion most likely comes down to partisan affiliations. "Certain Republicans have come out and opposed this deal, and I think the public who follow those individuals are going to be negative about it. But most of the public will embrace the fact that we can do something without a war, which is certainly a plus," Stockton added. Khalil Jahshan, a Palestinian-American Lecturer in International Studies, says the agreement made with Iran is proof that the U.S. can settle conflicts in the region without having to resort to war. "I would say that the U.S.-Israeli relationship is going through a crisis of serious magnitude that we haven't seen in a long time," Jahshan said. "For once, the U.S. decided to do what was best for this country and put behind what is the best interest for Israel." Jahshan believes that the agreement is going to be a win-win for both the U.S. and Iran, as both countries could see significant benefits in coming months. "This is an issue that has been nagging U.S. interests in the Middle East for several years now. But this can potentially save the Iranian region from economic instability and save us from an unnecessary war. It will open the door for the prospect of a good follow up, which could settle the issue in a permanent way, hopefully in six to twelve months down the road." In Iran, residents have given mixed reactions to the news. While some continue to oppose the idea of progress with the six world powers, many young Iranians have spoken out in favor of the developments, hoping the elimination of previous sanctions will result in a turn-around for the country's unemployment rate. The National Iranian American Council (NIAC) this week released a statement applauding the recent developments between the two countries. NIAC urged both the U.S. and Iran to ignore radicals who will continue to make attempts to derail the potential outcome of the deal. October 15, 2013 | Hundreds of Muslims gathered today in mosques across metro Detroit to celebrate Eid al-Adha, the holiday that remembers the willingness of Abraham to sacrifice his son to show his obedience to God. At the Islamic House of Wisdom in Dearborn Heights, Imam Mohammad Ali Elahi told congregants during Eid prayers about the importance of sacrifice. He also talked about ending terrorism and war. Elahi’s mosque, like some others, will have a second day of Eid prayers Wednesday because of differences among religious leaders as to the date of Eid. After Eid prayers today, some Muslims slaughtered sheeps, cows, and other animals to symbolize Abraham’s willingness to sacrifice. Other local Muslims are in Mecca for the pilgrimage known as hajj; Eid is marked at the end of hajj. The Islamic House of Wisdom (IHW) hosted their annual Ramadan iftar dinner on Wednesday, July 24, in Dearborn Heights. Attendees included 19th District Court Judge Sam Salamey, Dearborn Police Chief Ron Haddad, Third Circuit Cour Judge Chris Dingell and Dearborn Mayor Jack O’Reilly. Imam Elahi, spiritual leader of the IHW, was honored by members of the interfaith community and the Girl Scouts of Michigan for his contributions to interfaith relations. After a month of fasting from sunrise to sundown every day, there should be a noticeable difference in people, Imam Mohammad Ali Elahi says. "There is a before and after," Elahi says of the Muslim holy month of Ramadan, which is about half complete this week. Elahi, leader of the Islamic House of Wisdom on Ann Arbor Trail in Dearborn Heights, says Ramadan provides an annual opportunity for Muslims to become more obedient to God. From sunrise to sunset, Muslims refrain from eating, drinking, smoking or engaging in sexual relations. Many attend nightly prayer services at area mosques and then break the fast with a large meal. Many Muslims attend the meal, called Iftar, at a mosque. Others attend large buffets at area restaurants. Still others prefer to take their meals at home with their families, Elahi says. Ramadan is a celebration of the revelation of the Quran to the Prophet Muhammad. The Quran is the Muslim holy book. Ramadan culminates in a festival called Eid Al-Fitr. "Ramadan makes us more loving, more peaceful, more humble, " Elahi says. "We're building a better life for ourselves and our society." Elahi encourages Muslims to think about what it means to go without food and beverages — even water. 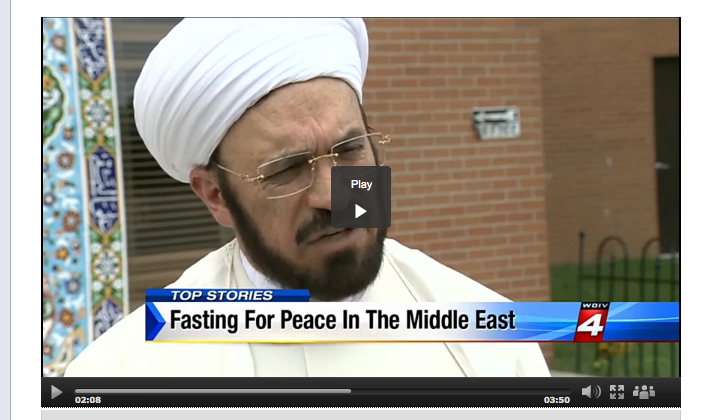 "We don't want to engage in fasting as a ritual," he says. "All that's doing is making people hungry and thirsty. We fast to dominate over our desires." Another benefit of fasting is that it allows Muslims to sympathize with those who don't have enough to eat, Elahi says, adding that he hopes it motivates them to increase their charitable acts. Children, pregnant women and those who are ill or traveling are exempt from fasting. The Islamic House of Wisdom is offering an interfaith prayer service at 8 p.m. today. Elahi says he expects members of many area churches to attend. Anne Runkle is a freelance writer for Heritage Media. DEARBORN HEIGHTS - Last week, Imam Mohammad Ali Elahi and Congressman John Dingell met to discuss U.S.- Iranian relations. The discussion centered on the election of the new moderate Iranian president and the opening of a new chapter in the relationship between the two countries. Imam Elahi (right) pictured with Congressman Dingell.Elahi asked the Congressman to refer to his wisdom and experience to help improve U.S. relations with Iran. He pointed out President Obama’s friendly messages to the Iranian people, over the last few years, and asked that the U.S. turn those words into actions and begin renewed diplomatic dialogue between "these two great nations." He described Rouhani's election as a great opportunity and a test for the Obama Administration to establish a direct dialogue with Iran, based on mutual interest and respect. Congressman Dingell promised to do all that he can to help and assured Elahi that he would assign a member of his office to continue this conversation. The Islamic Holy Month of Ramadan this year coincides with some of the hottest and longest days of summer. However, fasting in such conditions, could create health risks for people with certain medical conditions. Although the Qur'an says, "God does not require a person more than his abilities," some Muslims, who should not fast for medical reasons, still choose to observe Ramadan. Imam Mohammad Ali Elahi, the spiritual leader of the Islamic House of Wisdom, explains that if a Muslim personally fears for his health, or if a doctor tells him that fasting is harmful, he/she is not required to fast in Ramadan. If unable to fast during the Holy Month, Muslims are mandated by their religion to make up those days by fasting during a different time of the year. However, if a Muslim has a chronic medical problem and cannot fast at all, he should feed a poor person for every day of Ramadan that he does not fast, which is the equivalent of paying $5 to $10 to charity, according to Elahi. Muslims who are poor themselves are relieved of that fee. "Ramadan is supposed to make us healthier," says Elahi. "If fasting harms your health, then you have no obligation to fast." Dr. Samuel Fawaz, an internal medicine MD, says that some of his patients fast against his recommendations. Fawaz works at Beaumont Hospital in Royal Oak and does not see many Muslim patients, but he says that during his 9-year medical career he has seen many cases where patients, who are not supposed to fast, suffer dehydration and end up in the hospital because of their decision to observe Ramadan, regardless. Fawaz cautions some of his patients, respectfully, against fasting, but explains that sometimes they choose to follow the advice of clergy in the community, who suggest that they should observe the Holy Month. "As a rule of thumb, people with serious health conditions, like heart disease, or any sort of cancer, or kidney problems should not fast," he says. "Elderly people, who are already prone to dehydration, should not fast either." Fawaz says that the age when a person should stop fasting varies from one individual to another, depending on the person's health. But generally he would recommend that people over the age of 75 not fast. Elahi agrees that the elderly are not required to fast, but explains that no set age is mandated in Islam for older Muslims to stop fasting. It depends on the individual and his health situation. Fawaz points out that his medical opinions are his own, and that other doctors may disagree with him, as health issues are open to debate and interpretation. A Dearborn doctor, who wished for his name not to be published, agreed that all the health conditions mentioned by Fawaz constitute situations where people should not fast. The Dearborn doctor, whose patients are mostly Muslim, added diabetes to the list of medical conditions that should deter people from fasting. "Diabetics urinate more than the average person, so they run a higher risk of dehydration," he said. Elahi explains that people who fast and ignore their health are doing something “haram” (religiously prohibited), because Islam bans self-harm. "They might be doing it out of faith and with the best of intentions," he says. "But it is a kind of extremism. You are not supposed to harm yourself. We say that all the time." Fawaz adds that it may also not be healthy for children, under the age of 14, to fast, because their smaller physical builds do not contain a lot of water, and their physiology has not matured enough, so their systems have a higher risk of collapse under stress. "There is also the mental aspect," he added. "It is hard to tell children not to play outside in the sun when they are fasting. Kids are not mature enough to stay home and save their bodies' water and energy." Elahi said that boys in Islam are required to fast from the age of 15, or from the time they reach puberty. But the age of fasting for a girl is "controversial." Some scholars say that girls must start fasting at 9, while others say at 13 or 14. But, no matter which scholar people choose to follow, if a young girl finds it too difficult to fast, she should not be fasting, Elahi adds. Elahi explains that hardship is a component of fasting. People in Ramadan should go through the internal struggle of fasting to gain discipline and determination and to also understand the pain of poverty and hunger, so as to feel solidarity with the poor. However, he added, if people are at risk of losing their jobs, or compromising their health, as a result of fasting, exceptions can be made, because Islam is a religion of reason and rationality.